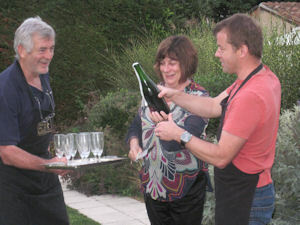 "The day with Simon was so much fun and we learnt so much"
Loire Wine Tours offers a selection of short break wine tours and wine tastings in the Loire valley vineyards in France for individuals, couples and for groups during our season from May to October. We are now taking bookings for our 2018 wine tours, so do not delay if you are looking to book our summer programme. Our first 2018 guests in May Jessica and Eric from the USA enjoyed a full day in the two village appellations of Puy Notre Dame and Champigny. 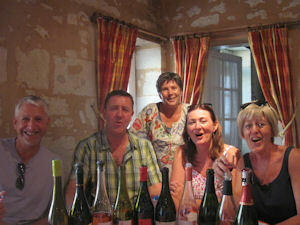 Our wine tours run from May to October. Check tariff for our prices. Join Simon and Karin Grainger at their beautiful La Grande Maison amidst the Anjou & Saumur vineyards in the Loire Valley France near Saumur, near the historic town of Puy Notre Dame. Loire Wine Tours invites you to discover, savour, reveal, explore, and uncork the grape with Simon on one of his wine tours. Be entertained and above all have fun. Delight in tasting some of the fine wines of the Loire valley France Loire valley wines. On our loire wine tours you will meet passionate vignerons, discover little gems in the vineyards and savour delicious French cuisine. Ah….the simple pleasures! Arrive at Manoir de Gourin yourself or we pick up from Angers and Saumur. The prices for our Wine tours can be found on our Tariff page. If you are interested in our self catering accommodation please visit our website manoirdegourin.co.uk. and see La Grande Maison Manoir de Gourin our beautiful destination in the heart of wine country. 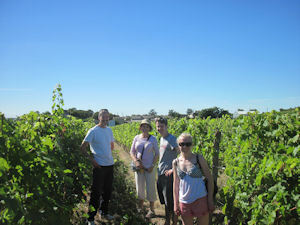 loire valley wine tours, french wine tours, wine tours loire, wine tour holidays france, wine tasting, tours, wine tours and wine tasting france, wine tour loire, wine tours near Angers and Saumur.